My first week went wonderfully. It was a blast seeing so many of you jumping on board to join me – at this point I’ve lost count of all the Plungers…but it is exciting to know that so many of you want to live every day like it is the BEST DAY EVER! You will find that the more you repeat those two phrases – “choose joy” and “best day ever” the more positive you will feel about your day. A few of my family members who joined me for Thanksgiving were also Plunging, so we held each other accountable to only eat until we were satisfied. And you know what? I didn’t miss anything – except for that horrible stuffed feeling that always makes me feel guilty. I actually felt GREAT. I heard from a friend who said this was the FIRST Thanksgiving in her LIFE that she didn’t eat more than she needed. And she felt great about it! What a blessing for her! I can’t wait to hear how it went for the rest of you! Black Friday was AMAZING. 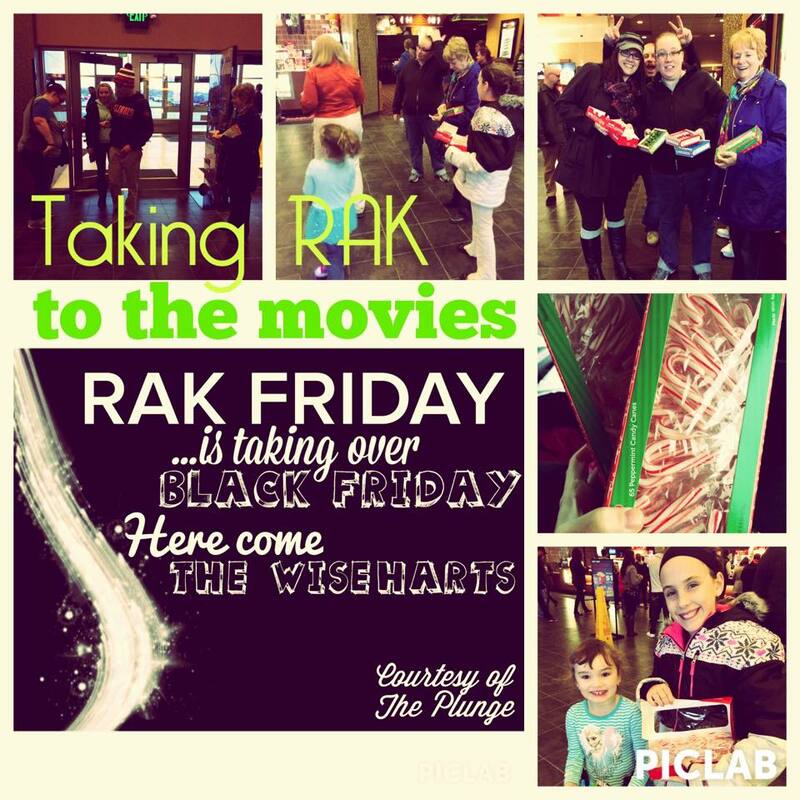 The Wisehart clan planned to go see “Big Hero 6,” so we planned our RAK ATTACK for the movie theater in Valparaiso. We bought over 300 candy canes and gave them out to employees and movie goers. The manager was so pleased she gave us free popcorn (the kids loved it!). One lady offered to donate to our “cause” (which we said was merely to show kindness) and another said it made her day. I could go on and on with the positive reactions. Only a select few said no to the candy canes…and most of them were eating them before they even got inside the movie theater! A couple people didn’t exactly know what to do with our kindness – but that’s okay. It’s sad that kindness is such a strange occurrence in our society. Now, let’s be honest. The dancing thing wasn’t very hard for me. I dance with my daughter regularly – in the house AND in the car. And every school day before Thanksgiving I always have my students do the GRATITUDE DANCE (which, by the way, had 100% participation from all 120 students and a couple co-teachers!). But I hope the dance part got many of you outside of your box and made you giggle. We all need a little more of that, don’t we? Please share your Plunge Reports in the comments below. Your experiences will be an encouragement to others – and to me! And be ready for the next PLUNGE coming your way this Monday! Also, please share with others and ask them to take THE PLUNGE. This is an exciting adventure we want to share with everyone. Hope you have THE BEST DAY EVER! Not everyone understood the “irony” of this picture. But most of those taking The Plunge did. 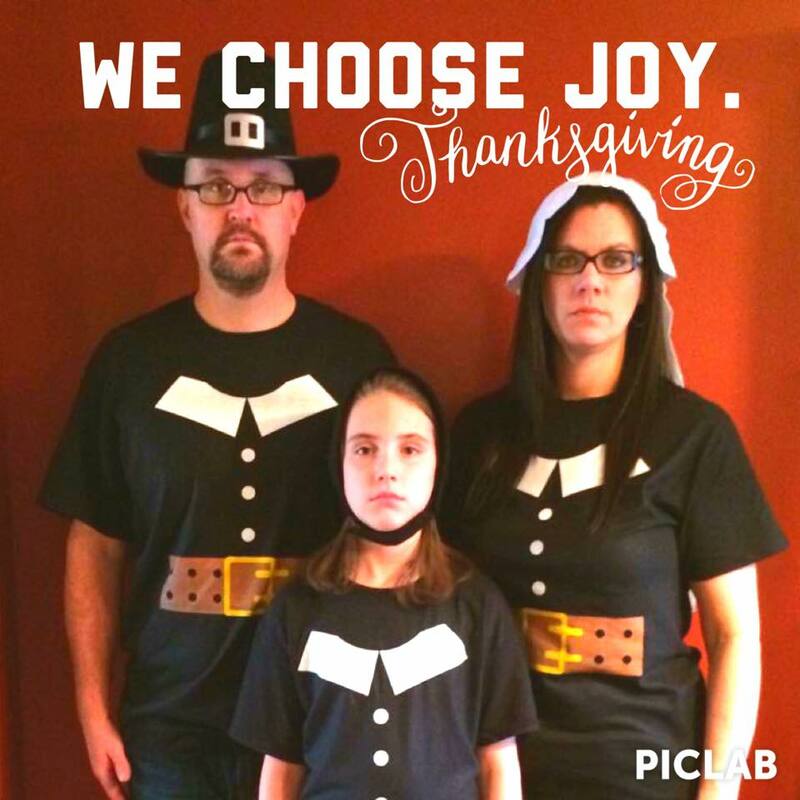 We had a wonderful joy-full Thanksgiving. We hope you did, too! Posted in The Plunge and tagged Thanksgiving. Bookmark the permalink. I did it! I did it all! This was so much fun! I am so glad, Katie!! Yeah, danced with my daughter for a bit – both she and my hubby thought something had gone wrong with me! RAK Friday – we surprised visited some friends we haven’t seen in over a year (which was TONS of fun), but then on Saturday, I took the opportunity to return a shopping cart for an older gentleman. I think I did pretty well on the eating thing. Probably had about 2-3 bites too much of dessert (wanted to taste the variety of options and seriously didn’t realize how much that was going to be). Fun time!!!! I did well on the Thanksgiving Day- it was great not feeling overstuffed. RAK Friday was fun. I put money in baggies for the laundry machines at a Sr. Citizen housing project. I hope it made someone’s day. Dancing to my jive music made me feel free and so worshipful. Look forward to a new week. Mary! I love your RAK idea! It sounds like you had a fabulous week! Get ready for tomorrow! It’s going to be a GREAT WEEK! The BEST WEEK EVER! Well i did not over eat on Thanksgiving and left food on my plate. Luckily i danced on Tuesday be because i woke up sick on black Friday and did not leave the house all weekend! I am so sorry you were sick, sweet friend! !